there are these things that get anointed as the version of a foodstuff that is actually pretty demotic and widely spread out and--while they are good, often, these avatar examples--they are reliably no better than the 'average' example of that demotic foodstuff; in fact, sometimes, because the reason you've heard about them is marketing or whatever, they are less good than the average example you'll find, wandering around on your own two feet. The post was longer; it had more jokes in it, more comparisons and stuff. But you don't get that post, because that post in this instance turned out to be wrong. I was not even going to try Tai Cheong Bakery on this trip. Because of the logic laid out above; logic that, I should emphasize, I still stand by IN GENERAL. you see this egg tart, fam? This egg tart is famous. Buuuuuuuut -- I was sitting here, working. And it occurred to me that it was 8:29 a.m. And it occurred to me that the activation energy required to slip on my shoes and go downstairs to this famous egg tart-ery that is literally thirty seconds from the front door of my hotel was extraordinarily low; and that this famous egg tart-ery often had lines et cetera et cetera (this is true. I have seen them. 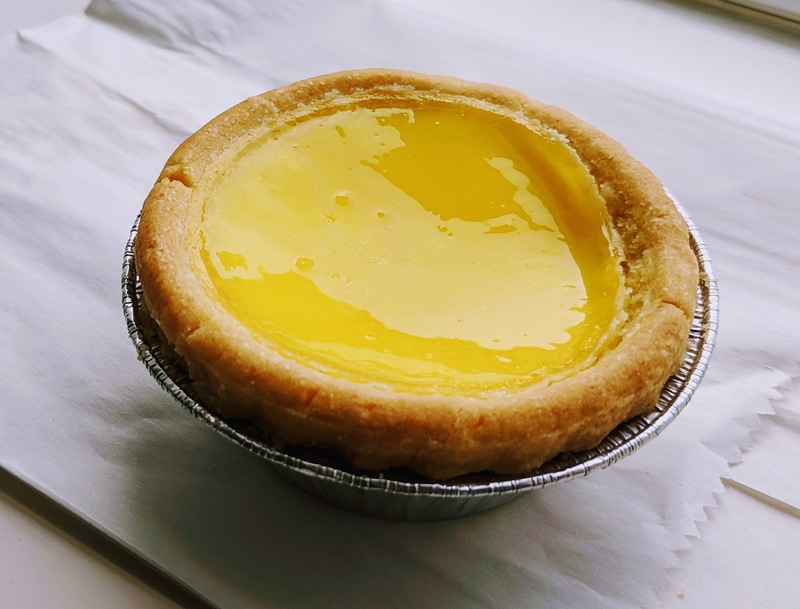 ); and that I had, in fact, wanted an egg tart this morning -- but laughingly (rightly) passed by some corporate bull$hit that was trying to sell me egg tarts for $25HKD cuz that $hit was written in English or something. $10HKD is high, but what I'd expect for a "high street, super-famous" egg tart. More than that is just nuts. But: stop. forget it. For I must yield to fact. For this egg tart, this famous egg tart from Tai Cheong...was kind of clearly superior to the 'average' egg tart. Low let's be crystal: by 'average' I do not mean some b.s. mass-produced, commercial centralized bakery egg tart. I mean the tiny little bakeries and cha chaan teng that sell egg tarts out their fronts in the mornings — those places. They make them fresh; they are very delicious. But this one was better. Mainly cuz of the filling; the egg-y custard bit. I couldn't discern a major difference in crumbling pastry 'tart' part; it was good, but not clearly that different or better. But the custard was better. It kind of had layers? There was a flan-ish depth, beneath a top that was not just the very top responding to air, but like a 1cm layer that sort of thickened more, almost like a shell but not. I'd experienced things a bit like this—I guess it's something the custard does—but this one did it more, and more richly, and more notably deliciously. Years ago, with one of my best friends, I went on a brief tasting tour of wines in Napa. We were both surprised—and, I think, a bit dismayed—to find that we could pretty easily tell the difference between some vineyard's $20, $50, and $90 bottles (I forget the exact price points, but you get the idea). I had certainly conceived of that exercise as a chance to free myself once and for all of the idea that I needed to buy more expensive wine, ever; it was interesting and surprising to have an opposite finding. This isn't that strong — I did not buy this egg tart with any agenda. I wanted an egg tart, and one with a bit of narrative attached happened to be very close and I happened to know the exact opening time because only the famous places like this that cater to tourists etc. show up on google maps when you search for the stuff that I search for at 4:13 a.m. in Hong Kong. But I did buy this egg tart, and I loved this egg tart, and I tip my hat to it, and to Tai Cheong, for the excellence and distinction they bring to a classic food item.